A survey of 20,000 properties in England and Wales by Your Move and Reeds Rains has shown an uptick in tenant arrears for March 2016. 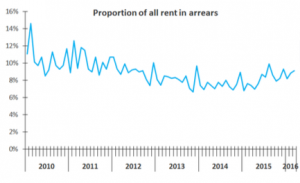 Whilst the overall increase is modest, up from 8.8% in February, to 9.1% in March, it does indicate a squeeze on tenant finances as rental levels continue to rise. Annual rental inflation is now running at 3% with average rents payable across England and Wales standing at £791 per month. However, the past two months have shown relative stagnation in rental increases. The year on year comparison is also unfavorable as this time last year, the March 2015 rental arrears rate stood at 7.4%. Despite this, the survey indicates a more encouraging trend as the current rate of 9.1% is still well down on the high of 14.6% of all rent payable recorded in February 2010. Clearly, the requirement to manage arrears is as important as ever and close monitoring of downstream issues will prevent arrears becoming onerous for either landlord or tenant. In the first instant, it means striking an equitable, affordable deal.